Part of maintaining your gun includes regular use of a high quality gun oil. This is important and will make a huge change in the high performance and effectiveness of your firearm. Whether your use your gun for hunting, self-protection or it is your hobby then learning how to care for your gun is vital. A malfunctioning gun can become dangerous so let’s take a look at the best gun oils to use with your weapon. 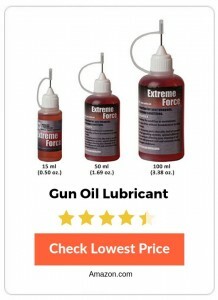 Gun lubricants and gun oils are not all made equal, there are countless products on the market so I have taken the time to research the best. Let’s take a look at the 10 best gun oil products available online. Break Free CLP is a synthetic blend of oils that is known for its corrosion prevention, ability to withstand extreme temperatures as well as migration abilities. Resistant to dust and sand due to antistatic properties this is a highly rated and high performing gun oil. This oil will penetrate and spread easily along the metal surfaces in your firearm including every crevice and pit. The long lasting lubrication film also works to reduce any sand or grit that has abrasive tendencies. Corrosion inhibitors are present which stops the formation of rust as well. As mentioned this is a synthetic oil blend which will never lose its viscosity, dry out or stiffen up in extreme cold or heat. Suitable for -65F to + 475F this oil even works after salt water immersion. This gun oil was initially developed for use with fully automatic cannons in the U.S Military. Made in the USA, this unique formulation combines cleaning, lubrication and protection all in one. 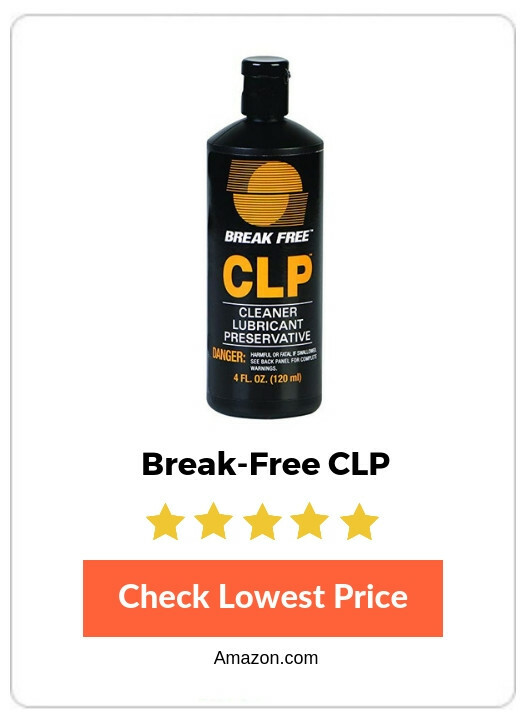 Recognized as the world standard for performance and protection, Break Free CLP is the go to product for the majority of gun users. Hoppe’s No. 9 is an advanced synthetic blend designed specifically for firearms. It is rigorously tested in tough situations and environments and works as a boundary lubricant. Type and volume: liquid, 2.25 oz. Designed for use with newer model guns that have modern alloys, this oil protects and cleans against corrosion and pitting. It is advised not to use mineral oil based lubricants due to the lack of migration abilities. 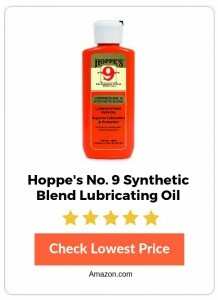 However Hoppe’s is a very well established company that has tested their products, the synthetic blend more that counts for the migration properties. It has a high customer satisfaction record as well. Made in the USA, Hoppe’s are a well established company who have produced a high-quality product. Suitable for modern guns, Hoppe’s No. 9 is ideal for metal alloy weapons. Stable across a wide range of temperatures it also offers protection against water damage and has anti-corrosive compounds. 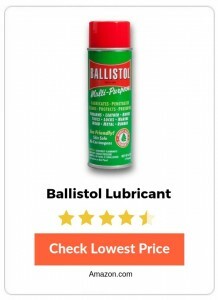 Ballistol Lubricant is a very popular lubricant used for a wide variety of applications – not just guns. It is biodegradable and slightly alkaline meaning it neutralizes the effect of sweat and skin oils. Type and volume: Aerosol, 1.5 oz., 6 oz. Initially developed for the German army for cleaning gun stocks, leather gear and firearms this aerosol is non-sticky. This product does have a non-chlorinated mineral base which are not recommended specifically for gun lubricants due to poor migration properties. This is a top performer however, which is largely due to the oleic acid and benzyl acetate which gives it the migration properties. Different to other lubricants, Ballistol Lubricant emulsifies with water, once the water evaporated the lubricant remains to protect the surface. This gun oil is a little more expensive than other products on the market and this may be due to the versatility and ability to use it for a range of applications. 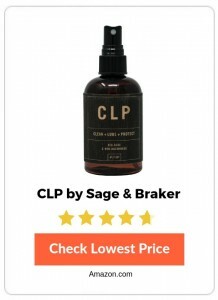 CLP by Sage & Braker use a penetrating solvent that gets into every surface on a microscopic level within your firearm. The blend also works to clean and protect from any dirt and crud that may be lodged inside. Free of harsh chemicals this lubricant also protects against corrosion and rust as well as providing a carbon and contamination management aspect. Type and volume: liquid spray, 4 oz. This is a liquid spray that has a very convenient to use nozzle. The CLP protects all moving parts on the firearm as well as the bore. In addition the working components of the firearm lead to improved heat dissipation which directly relates to a cooler weapon operation temperature. The formula also works to enhance the complete burn of powder in your cartridge which generates a consistent FPS and more accuracy. CLP by Sage & Braker is free of any harsh chemicals, non-toxic, non-hazardous and biodegradable. Manufactured in the USA, this product was designed for those in the military. 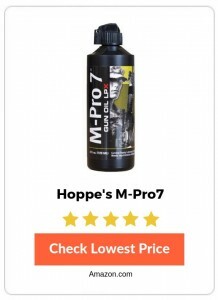 Another Hoppe’s product the M-Pro7 is a high quality, organic and biodegradable lubricant that also cleans. Recommended for use by the military, policy and weapon experts this has a renowned reputation. Affordable this is a 3 in 1 gun oil that works to clean, lubricate and protect your firearm. The formula repels dirt and grime with anti static properties. Boasting one of the lowest friction coefficients available, this product is also designed to protect against corrosion and environmental stresses. A highly rated and sought after product the M-Pro7 is highly recommended. Suitable for other uses, not just limited to gun maintenance this is a great product. With positive customer reviews it is hard to overlook this gun oil. 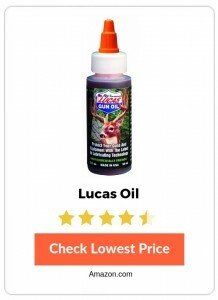 Lucas Oil is a firearm lubricant that was developed specifically to combat overheating machine guns and high powered rifles. Resistant to moisture and able to withstand high temperatures, this oil is a highly rated and high quality product. Package volume: liquid, 2 oz., 6 oz. Biodegradable and organic, if your gun is a rapid firing weapon then this is the gun oil you want to use. All weather and environmentally friendly, this lubricant is suited to sporting arms including pump, over/under and side by side shotguns, bolt and lever action rifles and revolvers. Odorless, this is the perfect choice for hunting firearms. It prevents jamming and overheating and penetrates rust to free stuck parts. It also neutralizes acids from fingerprints and will not dry out after long term in storage. Lucas Oil has the ability to withstand high combustion temperatures of machine guns. An ideal hunting lubricant, it protects against moisture and in odorless. Neutralizing the acid left by fingers on your gun is easy to do with this lubricant as well. Advanced Weapons Technology developed the Gun Oil Lubricant from superior compounds to withstand harsh conditions. With the ability to penetrate and spread across all metal surfaces, this lubricant will reduce your gun clean up time by 50%. Type and volume: liquid, 0.5 oz., 1.69 oz., 3.38 oz. The first acrylic based lubricant which to me sounds like it won’t migrate within the gun. This is product does, however, have excellent cleaning solvents which will reduce your gun cleaning time. For use with not only guns but also fishing reels, knives and any other precision mechanisms. This is a heavier bodied lubricant. With the ability to withstand both high temperatures and high pressure this lubricant also has protective ingredients to prevent rust and corrosion. Suitable for use with handguns to mini guns and everything in between. Special additives help with the cleaning by stopping contaminants from sticking to the surface. Gun Oil Lubricant is an affordable option that can withstand a huge range of temperatures and pressure. The only concern with this product is that it is heavier bodied and acrylic is the base oil which may mean difficulties with migration to all components of your firearm. FireClean Anti-Fouling Gun Oil is a conditioning oil that is non-hazardous, non-toxic and will protect your weapon. A powerful cleaner, this product offers long lasting protection against corrosion. Package volume: liquid, 2×2 oz. A multipurpose oil this is designed to clean and reduce carbon fouling. With a specially designed formula this conditions metal which makes routine cleaning much easier. Stable with extreme heat and extreme cold this product is also biodegradable and non-toxic. 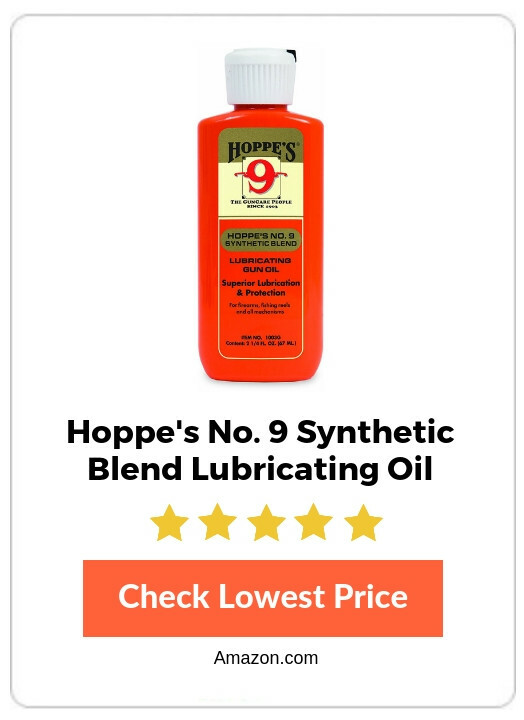 My concern with this product is whether it is a solid option for lubrication or if it is more so a cleaning solvent. 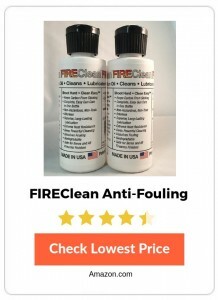 The FireClean Anti-Fouling Gun Oil comes with excellent customer reviews. Being non-toxic, many customers are pleased with the quality of the product as well as the ease of cleaning when the time comes. Hoppe’s Elite Gun Oil uses a T3 formulation which ensures proper upkeep and gun maintenance. Developed from dental drill oil a thin coat technology is used which gives long lasting corrosive protection. Type and volume: liquid, 4 oz. The friction coefficient is the best in the business due to the PTFE additive as well as liquid molybdenum. Great for use in the field there is also a spout tip which makes it easy to apply. The knowledge that this oil is also used for precision dental tools shows just how high quality it is. This is a hydrodynamic lubrication which means it will migrate exceptionally well but may be very thin in areas. 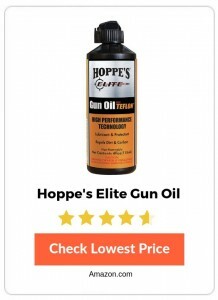 Hoppe’s Elite Gun Oil is a high quality product that has additives including liquid molybdenum and PTFE. Gun maintenance and cleaning of your firearm is easy to do with the use of this oil. 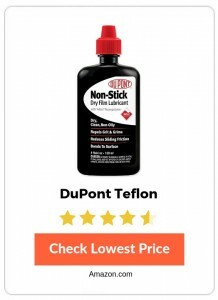 DuPont Teflon is a non-stick dry film lubricant that is long-lasting and creates a micro thin resistant coating. Teflon is known for its non-stick purposes and tolerance of metal on metal wear. Type and volume: powder, 4 oz. This is a unique product as it is 100% dry, it is free from silicone making it safe for all surfaces. Although no solid testing or analysis has been completed on teflon for use in gun lubricants this would be particularly useful for rust and corrosion prevention. DuPont Teflon is an interesting new addition to gun oils but is yet to be analyzed deeply to determine the effectiveness. A great concept, the anti rust and anti corrosive properties are attractive. How to Choose The Best Oil? Gun lubricants come in a few different forms – liquids and solids and even in some rare cases gasses. Generally they are a mixture of both liquids and solids, the liquid being the ‘base stock’ with the solids being the ‘additives’. Combining ingredients for the best gun oil requires science and engineering to ensure the end product is optimal. Firearms are generally used heavily for short periods of time but spend the majority of their lifespan inactive. There are many different lubricants but for guns they operate under two types of lubrication regimes which are boundary lubrication and hydrodynamic lubrication. To understand the best product to use for your firearm let’s cover the key difference in these types of lubrication. A thick layer of film lays between any moving parts. The film acts to stop any friction between the moving components which reduces any wear. Hydrodynamic lubrication extends the lifespan of moving parts, the most common application is with car motors. This type of lubrication works to resist corrosion and oxidization by creating a boundary. This boundary lays between the metal surfaces and the active components. Specialized coatings such as titanium nitride or nickel boron can be used in the thin film to reduce friction as can Teflon and molybdenum. Depending on where you plan to use your firearm the best base will differ. To protect your firearm the lubrication needs to be able to move around to adjacent areas within the weapon. When applying it you want a gun oil that has a low enough viscosity to flow into smaller spaces and lubricate every part in the process. Additives to lubricants change the chemical composition and the effect of the lube on the gun. There are many different additives which are related to different functions of the gun. One of the most frequent additives to gun oil is AW/EP which means Anti Wear and Extreme Pressure. A high quality gun oil will generally have these additives in them, they are tiny solids which thicken the oil. Many different combinations are used or tailored to suit the needs of the user. Knowing what to avoid in a lubricant is also important to understand. Chlorine compounds or chlorinated esters – these can lead to stress corrosion cracking (SCC). This means microscopic pits and cracks develop under heat and pressure which will eventually lead to a malfunctioning gun. Benzene compounds – Commonly used in motor oils these are not good for human skin so use on a firearm is not advised. Mineral oils – Poor migration properties meaning parts of your gun won’t be well lubricated. Silicones – Although good for water protection they add to the wear of your guns working parts. Graphite sprays – These are of no benefit to a gun. Do you Really Need Gun Oil? Yes. Wear and tear on guns is significantly reduced when using the right gun lubricant. The barrier created between these moving parts will have it running effectively and efficiently. Although not visible to the human eye, there are plenty of tiny cracks and depressions within your firearm. The use of a gun oil lubricates the internal workings of the weapon and makes for safe and effective use. Gun oils have additional ingredients including anti-rust agents, extreme pressure, as well as anti-wear agents. In some instances, detergents are also added to the lubricant which also work to break down grime and debris within the gun. Although this should not replace a gun cleaning kit and thorough maintenance, a gun oil can help to maintain your weapon. No. If your gun is already significantly worn from extended use without lubrication then even the best gun oils won’t be able to fix the problem. Regular maintenance and regular use of a lubricant will prevent the wear and tear occurring. Q. How do I Apply Gun Oil? Learning how to maintain your gun includes taking it apart to thoroughly clean and lubricate it. There are problems associated with both over lubricating and under lubricating your weapon. Ensuring that you use the correct amount is very important. Read through guides or follow YouTube if you have never done it before. Like everything, the more often you do it the better you will become. Q. What about these Miracle Gun Oils? Be wary of any products claiming to be a miracle gun oil, there is no such thing. All lubricants fall into the same categories, the difference is in the additives which should only be selected depending on your needs. Don’t buy into the gimmick products, gun oil has always been around and it always will be. The products reviewed in this post are all high quality and worthwhile trying. Q. Do I Need Different Gun Oils for Different Weather Conditions? Yes. Most gun oils are made specifically for use in extreme weather conditions including both cold weather and hot weather. They are blends of different products that work within a set range of temperatures. If you live in a cold climate then be sure to check the product is suitable for low temperatures. Taking care of your firearm includes using the best gun oil and lubricants possible. This will significantly reduce wear and tear created by friction within the weapon. Lubricants play a very important role, so find the best one for your needs and learn how to use properly. Understanding how gun oil works as well as the different additives used helps to make an informed decision. Through this easy to follow guide you will now have all the necessary information to make the best choice for your needs. A properly cleaned and well oil firearm will perform well every time, regardless of how long it has been inactive for. Choosing the best gun oil doesn’t need to be difficult. There are many different models on the market so I have shared detailed reviews of the best products available. Be sure to read through thoroughly before making your decision. 8 Best Shoulder Holsters Available 2019!